Helene Mass was born in the eastern province of Posen in 1871, the year of German unification. Like her contemporary, Ethel Kirkpatrick, she first became a painter. 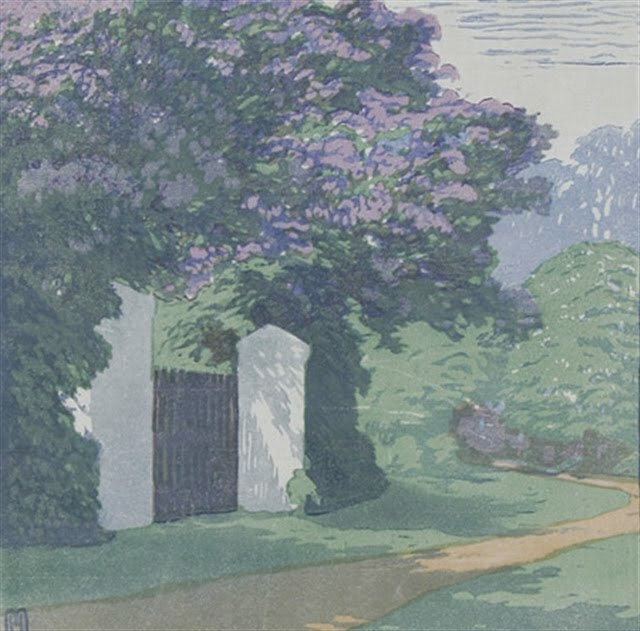 She had trained at the Academy of Arts in Berlin before taking up colour woodcut. 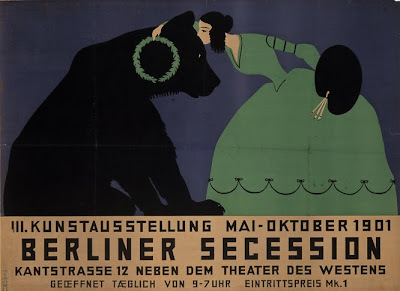 How she learned and why is hard to say but her early style is well in keeping with the late Impressionism used by artists associated with the Berlin Secession. Her delicate colour woodcut 'The garden gate under blue lilacs' pins her down both as colourist and plein air. 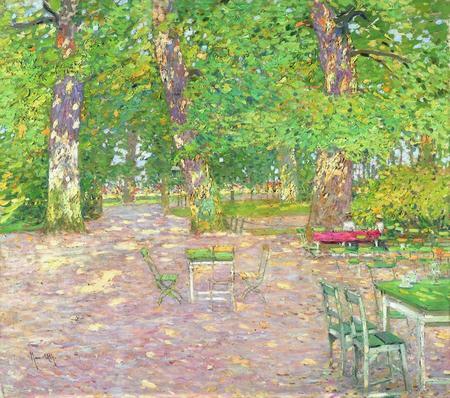 Max Uth (1863 - 1914) painted 'The beer garden' below in 1905. 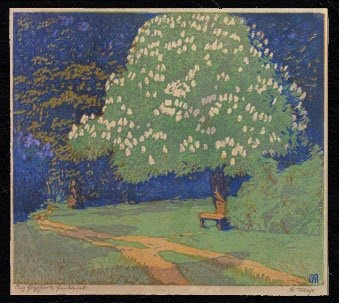 As we have no dates for any of her work, it is impossible to say when she began to make woodcuts but it cannot have been earlier than about 1905. 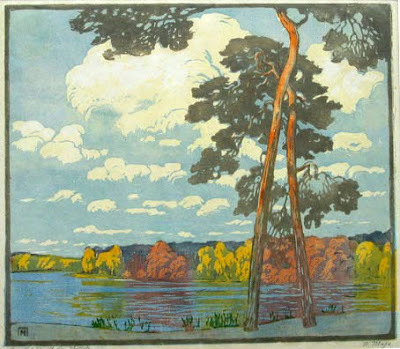 She has shifted in this second woodcut towards art nouveau stylisation but in both prints the subject and not the design has primacy. Even so these were exactly the kind of blue trees the Kaiser himself took exception to. (Being a hunter, he said, he was quite sure he knew that trees were green). This deliberate use of colour is typified by the superb poster for the third exhibition designed by Thomas Heine (1867 - 1948). Nor could I resist adding this evocative photograph of an early hang. 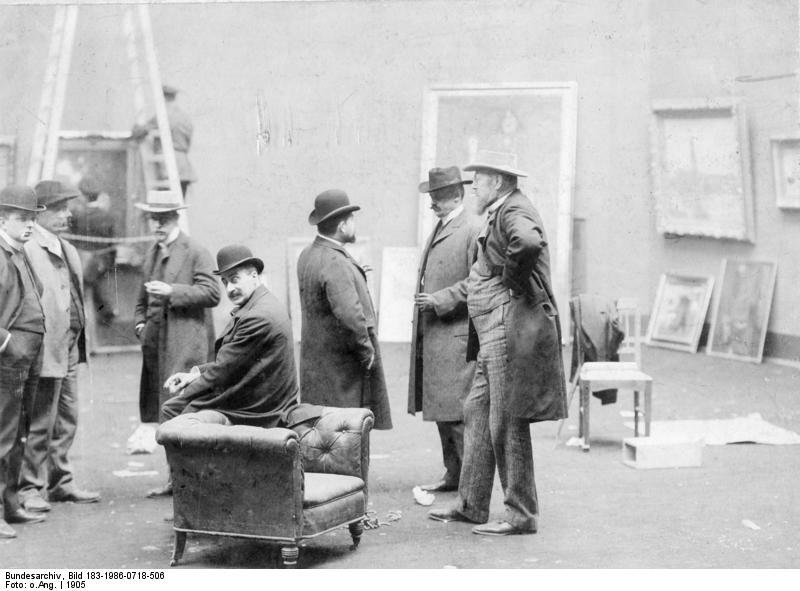 The man on the far right is Leopold von Kalckreuth - see more of his impressive profile under 'O was for Orlik'; also there, Lovis Corinth, third from the left, (see Wim Zwier's portrait of him) and Max Liebermann, the president, turning, as always, towards the camera. I've tried to include only strong work by Mass. 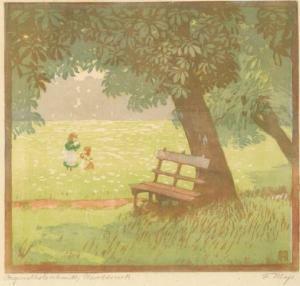 The print below, 'Children in the park' is weaker but continues her parks and gardens theme. Instead of the Luxembourg or the Grande Jatte, she perhaps gives us the Tiergarten and the lakes and wooded countryside around the city. This is what I think. It is a recognisable world, anyway, that she creates, often heavily canopied. (Unfortunately, I've been unable to include an image of a house being overpowered by Virginia creeper in the autumn). I think these final prints see her moving to a later style, the first probably pre-war. It strikes me there is something more in keeping with Carl Thiemann. But without any documentation, it's all conjecture, really. There has also been conjecture about her so-called disappearance. Her work certainly isn't common but the reasons for this aren't hard to see. The National Socialist Society for German Culture was formed in 1927, the original Seccession folded in 1933 - and as I've tried to get across, that was about making artists accessible to the public. Then in 1937 all modernist work was cleared from German galleries and museums. If she was still living in Charlottenberg, as I assume she was, the allied occupation of west Berlin after the second war saw her isolated in another way. One source has her resident in the city as late as 1953. When I bought this last print, I couldn't even read her signature. At least I can see now that she was never really a ruralist. She gives us a familiar world of trees, sky and water, both elemental and suburban, ie the one we know. She is indeed wonderful, and all subjects close to home learn that beauty is all around us. A few weeks ago a lovely print (lake + grasses) in wonderful colours was on ebay. Lots of interest too. This is good reading, nice posting! Thank you. I'm glad to hear people enjoy the posts. Did you by any chance save the Mass image from ebay? I could do a follow-up post. As you say, the interest is there.